It can be daunting embarking on a new program as an inexperienced cyclist, there are so many things to consider and it’s hard to know where to start. Our team at GGH are here to help and this 8 week plan is easy to follow and will see you riding big distances in no time at all. Regardless of if you are new to cycling or just looking to get back on the bike, this plan will carefully guide you through a training programme which will help to build up your knowledge, fitness, and confidence on the bike and on the road and see you smashing your fitness and cycling goals. The time commitment for this plan ranges from a minimum of 1 hour 30 minutes to a maximum of 5 hours per week. It covers 8 weeks of training with three rides each week and includes rest days as well as time allocated for mobility and strengthening work. We use time guidelines to work from rather than distances with gradual increases in duration to get you closer to the end goal. The rides indicate a flat loop which basically means no big hilly routes to start with although they may be undulating. You can substitute one or two of the midweek rides for an indoor session. However, it is important that at least one ride a week is out on the road to allow you to develop your bike handling skills and confidence as well as your fitness. Riding in a group is also recommended to get you comfortable riding in a peloton. Each week is also broken down into useful hints, tips, and suggestions to help you get the most out of every session. A regular bike service is a must to keep your bike in a good and safe condition. If your bike has been stored away for a while you will need to get it to your local bike shop for the once over before you start. A bike that is not running well will eventually hamper your energy and enjoyment. Cam’s Cycle Coaching – http://www.camscyclecoaching.com. Consider getting a professional bike fitting. Your bike will be set up with your measurements and proportions and adjustments made to fit you exactly, making riding more comfortable and efficient. You don’t have to spend a fortune on cutting-edge gear, however, a helmet, lights, water bottle, and padded shorts are essential. As the plan progresses, you will also need to purchase cycling shoes and pedals. Appropriate clothes for the weather conditions will also be a necessity. Ask your peers if they have any secondhand clothing, gadgets etc; this could get you through a segment of your training program or allow you to try before you buy. Please mention you are a GGH rider they will be more than happy to help you, explain anything and answer any questions you have. Avantiplus also offers GGH riders a 10% discount. A structured exercise program can be tough on your body to start with and we recommend you take note of the maintenance sessions suggested to help with your preparation and recovery. If you have any issues or concerns regarding your fitness consult a doctor before starting. Nutrition is a key component to your success with any training program The basic rule of nutrition is that you need 30gms of carbohydrates every 30mins of training, this can be from fluid or solid food. The key is to get into the habit of eating and drinking on the bike that way you will be able to eat little and often. Kirsty will work with you and your goals if you need professional help. The sessions are based on outdoor rides but can be done indoors if preferred, just adjust your gearing according to the effort required. The training sessions/rides are based on your Rate of Perceived Exertion (RPE). 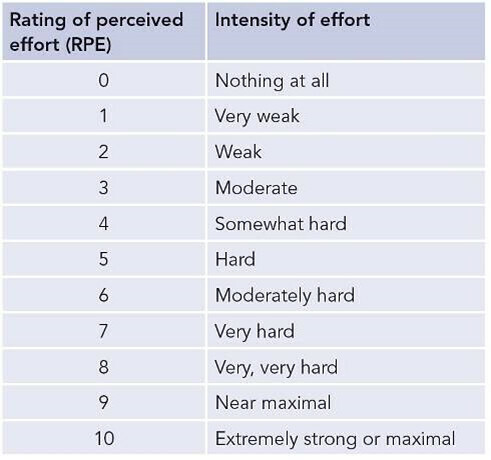 This is a numerical indication of how hard you should be working, ranging from RPE 1 (minimal effort) through to RPE 10 (maximum effort). For the majority of the sessions, you should be working at a pace where you feel comfortable enough to hold a light conversation, but at some points, the plan will push you harder for short periods. See chart below. This first week is all about building confidence and comfort. On a flat, steady route away from heavy traffic, use each ride to check your bike’s set-up. Make sure that you are happy with the way your body positioning feels when riding and make adjustments if necessary. Slowly increasing saddle time. Fix any issues that may have occurred in Week 1 and check your tyres for debris and potential punctures after every session. Hydration is important on longer rides, so practice taking your drink bottle out while riding and sip regularly throughout your ride. For an added energy and nutrition, use sports drinks or water supplements containing electrolytes and carbohydrates these will be necessary when riding longer two hours so it is good to start testing different drinks now and see what you prefer. Focus on your peddling technique – you should be pushing down and round in a circle through your foot on the pedal. with your knees pointing straight ahead. Aim to pedal at a cadence of 80 revolutions per minute (RPM), changing down to an easy gear if you feel your tempo slowing. Add a 20-minute burst of effort (RPE 5-6) by increasing your pace or planning a route with inclines during your midweek ride. As you reach the halfway point, a two-hour weekend ride should be achievable. Over this distance, you will need to take on food while riding, so it’s a good time to start practising. Try any packaging for energy bars or lollies before placing them in your pocket to make it easier while riding. As with hydration, the key is to eat little and often – attempt to eat every 20-30 minutes using natural, high-carb foods like bananas, dried fruit or flapjack. You should comfortable to start increasing the tempo efforts a bit more this week. If riding for two hours is still a little daunting, try planning a cafe stop at the midway point. This will not only give you time to rest and refuel, but it will also split the ride into manageable sections. This is your halfway mark, you should have your cross training workouts and your mobility and strength training program organised for at least twice a week, mixing up cardiovascular exercises with core strengthening activities like Pilates. These do not have to be long sessions and can be done at home. As the rides get longer It is also important to start planning your post-ride food and eating as soon as you get back from your weekend rides, this will kick-start your body’s recovery. You will need some protein and carbohydrates, a tuna or chicken sandwich is ideal or if you don’t feel like eating, try a banana blended in 500 ml of whole milk/almond milk with some oats. Checkout our nutrition plan here. Your weekend ride this week will be your longest during this training program so really concentrate on getting your pacing and nutrition right. If you are group riding, make sure that you are rotating through the front so that you get used to riding out at the front and rolling through the peloton. Check out our tips on riding in a group. This week we also start some hill repeats so find a climb that is not super steep or long but hard enough so that you are out of breath by the top. As you are riding and if you feel confident, experiment with climbing while standing. Using a low gear and staying seated is generally more efficient but sometimes you may find that a steep hill will force you to stand up so its good to get some practice in on easier climbs. While you are climbing keep as relaxed as possible and keep your cadence high. When you are descending keep your eyes on the road ahead and look where you want to go, try not to focus directly down on the ground in front. Use your brakes before entering a corner and then let your bike travel through the corner, don’t brake sharply. If you can, use the handlebar drops as this helps to distribute the weight evenly giving you more control. Use the first session of the week to concentrate on climbing again, pushing the pace a little more on the way up. Keep practising your technique both ascending and descending, it will get easier the more you practice. You may feel a little tired this week but don’t worry, there was a lot of riding last week Gradually the amount of riding over the next two weeks will lessen and your body will recover, ready for your 50 km ride. Don’t be tempted to try and squeeze in any last minute rides, trust in the training you have done over the past 8 weeks. It’s a good idea to start making a checklist of the kit and food you will need next weekend for your long ride. Its good to practice getting into the habit of doing everything you can a few days/week before your big rides to avoid unnecessary stress on the day. Make sure you don’t neglect your pre, during and post ride nutrition on this shorter weekend ride. You will need the food to recover and become stronger so ensure you stick to the same routines that you have been practising. If you have followed the training plan you should be feeling confident about your 50km ride at the end of this week and you will definitely be ready after all of your hard work and preparation. The rides this week are to prepare for Sunday just light and easy workouts, both on and off the bike. Prepare your food and drink ahead of Sunday and plan a route. Finally, remember to stick to your plan and most importantly enjoy the ride!